We call them crabs, but to be correct, these tiny pinkish brown creatures are shrimp, fished by specialized boats in the North Sea. As a kid, on the rare occasions my parents took my two younger brothers and me to a restaurant, I would invariably order a shrimp cocktail. It always came in a short-stemmed glass, the shrimp nestling on a few green lettuce leaves, partly covered by the sweet and fruity rose-colored cocktail sauce. But those were pink shrimp and rather large. Back then, Nordseekrabben were thought of as much too perishable to transport. Nowadays, with better preservation and transport, you can find them in supermarkets. 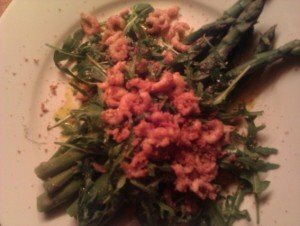 One of my favourite ways to serve them now that spring is almost upon is on top of green asparagus and rucola, drizzled with avocado oil and topped with some tuna bottarga – what a luxury! But to experience them at their best, all sweet and delicate, I still like to get as near to the water as possible. Fishing family Urthel’s place in Friedrichskoog a 1.5 hours drive north of Hamburg is unpretentious, with seagulls screeching and the smell the seawater setting the scene. Besides total dedication to freshness one of the Urthels’ assets is a shrimp peeling machine. This means that even uttery unexperienced hands like me can indulge in large amounts of shrimp without having to spend hours at removing the tiny creatures’ shells (for the supermarket stuff this is mostly done in Northern Africa and other cheap labor countries). A dash of lemon, some white bread, or perhaps a spoonful of the Urthels’ homemade potato salad, that’s all I need with my shrimp here. If I feel entitled to even more indulgence, I make my way to the exclusive Sölring Hof on the island of Sylt or book in at the Birke family’s hotel in Kiel who both offer not only fresh Nordseekrabben, but also local lamb, goat cheese and strawberries. Early summer is the season to go, when all these delicacies are at their best, including local pickled herring. The resurge of interest in regional food up here in the north has taken the form of an organisation called feinheimisch, a new word creation linking fine, local and native. Chefs, gardeners, farmers, fishermen and restaurant owners are joining forces in this network to further awareness for homegrown products, raise quality levels and develop a distinctive regional cuisine – and that’s more than fine with me.